feeling stitchy: Let's talk about floss! I have always used DMC floss. I like it and I can get it locally in lots of colors! I've never had a problem with using it, getting it or finding the color I need so I've never thought to use anything else! I exclusively use DMC floss. That is the only brand available in my area. A long time ago, both Anchor and DMC floss were available, but I liked the DMC color palette better and the colors seemed a bit more brighter than Anchor's. I love that I can split the strands in DMC floss, over time, I've realized that I like to stitch with 2 strands. Knock on wood, but I've never ever had any problems with DMC floss colors bleeding. I don't have an opinion about floss, but I LOVE your header! Makes me want to learn to embroider :o) !!! I use primarily DMC, because that's what's most readily available to me. But I have had a problem with bleeding...specifically with a dark dark brown color and a deep red. Now, I presoak my dark colors overnight in a dish of water/little soap then rinse and press and let dry before using. I used moon floss just now. I'm not sure how good a brand it is because noone ever mentions it on the blogs I read, but I got a huge pack of it for cheap and I love it. It comes in loads of lovely colours and I've never had a problem with it (apart from it getting knotted but I imagine that happens all the time anyway :P). I generally default to DMC, but I used to have to get floss at Wal-Mart. Since then I usually pick up a few colors of whatever I feel like where ever I am. So if I am not looking for a very specific shade like "Ultra Very Dark Dusty Rose" (DMC 150, my favorite), I just grab the color I am looking for and very often end up mixing brands in various projects. I've traied several brands of cotton floss, and although I can tolerate coats and clark, it's hard to find where I am. I use DMC. I find it difficult to work with some other flosses. The seems to tangle more, knot more and fray more. I've never pre-washed my thread and I've never had a problem with DMC. I hate to say that I never use silk because it catches so badly on my hands. Polyester does the same sometimes. I'm not a fan of polyester. I prefer the cotton, but I'm not sure why. I have one issue with DMC. If they are going to sell a color card they should actually put thread on it rather than just the photo. No problems with bleeding but I agree, DMC is the winner for me. Cheap, easy to find and a wide selection of colors make it a winner in my book. Hmm, I don't have a preference. Whatever brand is in a particular store when I need some is fine with me... All the displays get me the same, though, I LOVE color coordination. For years I used J&P Coats, which was available in my area. Now all the stores that sold it, moved out, closed down, or quit selling it. I go to Hobby Lobby to buy DMC. Any brand I used, I have never had any problems with bleeding. (lucky me) I have bought whatever or no name brands at Herrschners.com and i like those too. I've actually only ever used the DMC floss. I'm afraid that the cheaper stuff in the multipacks may bleed or fade, and I've not seen a lot of Coats and Clark or Anchor. DMC is just the most accessible to me and they seem to have tons and tons of colors. I've tried other brands, but I prefer dmc thread. 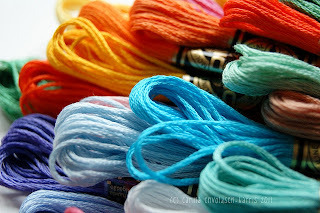 I have go to colours and they work well for my embroidery. I find the cheap stuff tangles too easily, so I mostly use Anchor or DMC, depending on what kind of store I'm in. I tend to use Anchor if I have the choice because they have a lot of "slightly off" colours which I like, kind of like how you don't want your paint to look like it came directly from the tube. The lady in the shop said it had something to do with petit point needing more subtle colours. DMC & Presencia are most reliable, IMHO. Others are thinner, and/or fray, break and tangle more... not worth the perceived "savings." dmc and anchor are both color fast. anchor is made by coats and clark and is most commonly available in the uk, where dmc is more available here in the us. dmc! i have have both dmc and j&p in my stash, but i prefer the depth of colour and the sheen of dmc. i also find that it's less "fuzzy", and it separates really nicely - i mostly stitch with two strands. i've never tried coats and clark floss because i think their sewing thread and their machine embroidery thread is mediocre (i'm a thread snob! ), so i assume that their floss will be as well. some of my vintage flosses are other brands, but i'm pretty careful about using them in projects that will never get wet, etc. silks and polyesters bother my hands as well, but my sister is so in love with hand dyed silk floss that she's using it exclusively now. oh, and i like madeira! their metallics are lovely. I'm in germany and all I can find locally is Anchor. But I love their colors, there's loads that go from bright to muted in 5 or 6 shades. I separate all my floss, I don't think I've stitched with all 6 strands in years, and it separates nicely when you keep some tension on it. I think I'd like to try the DMC floss, but I don't think it's as available in germany as it is elsewhere. for the past six months or so, based on availability, I have been using DMC only, which has worked just fine, I like the range of colours it has... funny but I had no idea of the brand I've been using until I read this post and went to check in my tool box! DMC is what both of my grandmothers used, so naturally it's what I use. But I also use my Grandmother's thimble and my Great-Grandmother's wooden quilting hoop, so I may just be partial to tradition. In any case, DMC is the easiest to find. The gold-standard of floss, in my opinion. I'm sure there are other lovely brands out there, but I'm a stick-with-what-you-know kind of girl when it comes to materials. Here in Spain nearly every shop have Anchor and DMC floss, so it depends on my particular project that I choose one or another. For me their quality is identical, they don't bleed nor fray, and I can separate the strands nicely and easily. I've been working with Gentle Arts threads and Cosmo (Lecien) threads lately. Love the silkiness of them. My fall-back, however, is always DMC. It's time for my 2 cents! Most of my floss is DMC as it is widely available and the quality is good. I also have quite a few Anchor colours and, like Lindsay, I like the fact that their colours are 'slightly off', indeed like mixed paint colours. I had no idea that Anchor was actually made by Coats & Clark either. The worst experience I had with floss was some fake DMC (yes, it exists!) that I bought on a market (I was on holiday and needed some 321!). The quality was terrible and the colour bled. I would love to try the Cosmo floss but haven't been able to buy it yet! @Grannysue I have a DMC floss colour chart at home with the actual flosses on them. See it here: http://blog.followthewhitebunny.com/2010/11/book-of-flosses.html It's not cheap but it's handy for pattern making and when you buy floss online. DMC is definitely my preferred, I bought a cheap multi-pack and found the floss to be much scratchier and more prone to tangling. Less shine as well.